What is Excessive Sweating Treatment? Excessive sweating or “hyperhidrosis” of the armpits, the face, palms of the hands or soles of the feet can be treated non-surgically with injections. This is the most common and effective treatment available. What is the excessive sweating treatment? Excessive sweating can be treated with anti-wrinkle injections. These injections are a muscle relaxant which when administered correctly can slow the body’s release of sweat. Costs will vary depending upon the number of areas to be treated and the numbers of vials used for injections. Dr. Verma will discuss this at the time of consultation and provide you with full costs. Do I qualify for excessive sweating treatment? 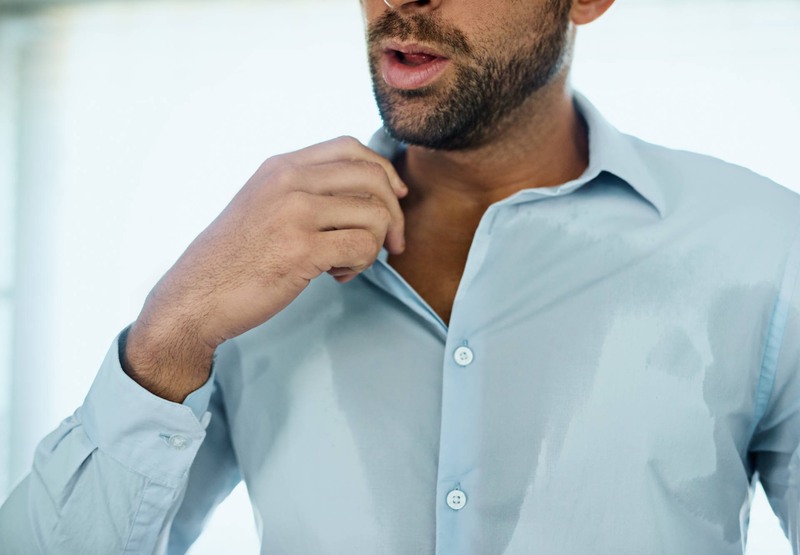 Although excessive sweating does not cause a health risk, it can be very embarrassing. If you suffer from excessive sweating that is unable to be controlled through usual methods you are likely eligible for excessive sweating treatment injections. Dr. Verma will discuss your areas of concern with you and provide you with details on how the injections work as well as costs for the treatment. In most instances, you will be able to undergo treatment on the same day as your consultation. What are the side effects of excessive sweating treatment? Side effects are rare and usually limited to the pain felt at the injection site, and in rare instances over compensatory sweating in other untreated areas. There is no downtime following this treatment. Results are noticed after 3 days with full effect in 2 weeks. The follow-up period will be determined by the length of time required for re-treatment. How long do the effects of excessive sweating treatment last for? Injection treatments are effective from between 3 – 6 month depending upon the individual.